Easily circulate the water in your hydroponic garden using the Little Giant Submersible Hydroponic Pump. This hardy unit offers reliable and continuous operation, keeping the water flowing around your plant roots for a healthy garden. The durable, aluminum chassis protects the pump motor, and the submersible design is well suited for continuous pumping. A generous, screened base keeps debris from reaching the impeller, and can be removed for cleaning or maintenance. This design also allows you to use the pump for water removal for short amounts of time, ensuring a truly versatile and durable piece of equipment. Its threaded outlet accepts 1" MNPT fittings, and the unit also includes a garden hose adapter for more attachment options. The top handle makes it simple to lift and check the pump for periodic maintenance, and its automatic, thermal overload protection ensures a safe and lasting item. 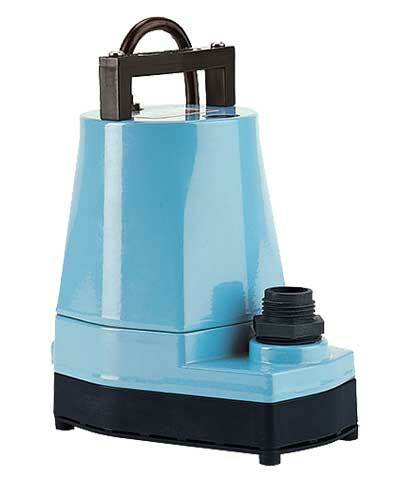 Move water throughout your hydroponic garden with this Submersible Hydroponic Pump. One year limited warranty.